We left Friday evening to make it up to Daventry but while we were on the train we realized we weren’t sure which hotel we were going to. Since we don’t have smart phones we couldn’t just google it so we had to call up our flatmates and learnt it was the De Vere hotel in Staverton Park otherwise known as the middle of nowhere. From London we had the option of getting the train to Rugby (12 miles away) or the Long Buckby (6 miles away). Trains to Rugby were more frequent and faster so we chose that route. Our taxi driver enquired as to what we were planning to do at Staverton Park as there is nothing near for miles and we explained to him we were playing in a Chess league and we left it at that. Saturday morning at breakfast, I was so surprised to see so many people already there but it was nice not to be in a rush on Saturday morning with travelling and then playing in the afternoon.Guildford 1 faced Wood Green Hilsmark Kingfisher 2 or WGHK 2 for short. Gawain played IM Lawrence Trent(check out his podcasts!) and was probably lost but held on and forced perpetual. 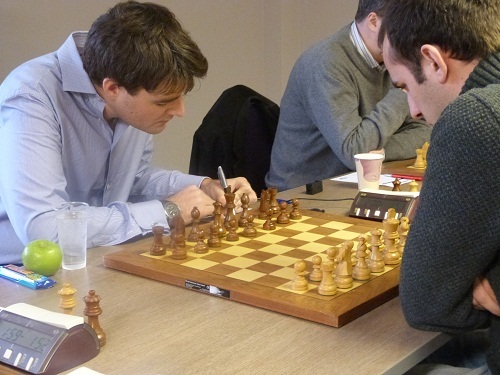 Gawain against IM Lawrence Trent of FEB fame. The teams drew 4-4 to Guildford’s disappointment. WGHK2 had a strong team, fielding 2 GMs, 5 IMs and a WFM whereas Guildford 1 had 6 GMs and 2IMs. 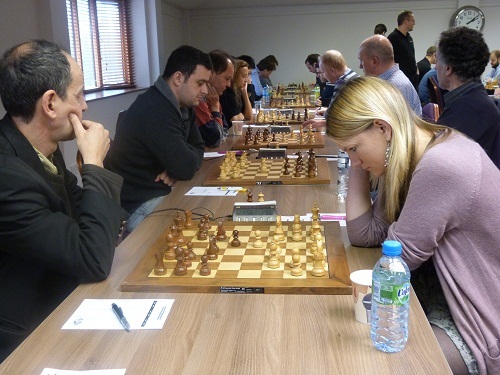 My team (North East England) faced King’s Head and I got to play CM Felix Kwiatowksi who I managed to beat in Hastings, I got a nice edge out of my opening but then misplayed it in the middlegame and blundered the exchange. It was one of the moments that a few moves previously I thought “You can’t do this” and then forgot the thought and played it. I manage to fight on and I held the draw and missed dinner. We originally were going out for a meal to celebrate Ga’s teammate Antoneata Stefanova on her recent run at the Women’s World Champ but I played on too long and Ga being the lovely husband he is waited for me. We managed to walk through the wilderness (okay, more like the main road then a bit of dark then a village – but for a city girl :-)) to get to a pub which had delicious food so all in the world was okay. After dinner, we went down to the bar to socialize for a bit before Ga noticed I was falling asleep and told me to go back to the room and he’d be back soon.The next morning, I needed more beauty sleep so Ga went to breakfast without me and let me have an extra 30 minutes lie in. I was actually debating whether or not to go to breakfast but thought 8 hours should be okay for me to function. Guildford 1 faced Jutes of Kent who were missing two star players in their line up. 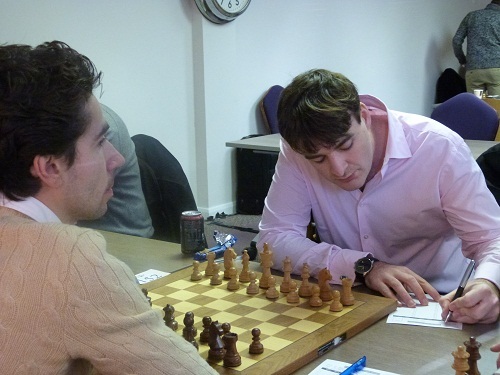 IM Hjovar Gretarsson is currently playing in Wijk aan Zee C group and GM Simon Williams was ill and we hope will get better soon. With that in mind, they still had some tricky Icelandic players IM Bragi Thorfinsson and up and coming junior Ezra Kirk. Gawain’s opponent played an offbeat opening that didn’t work out very well and Gawain got a huge attack very quickly! One thing I know is not to give my husband any initiative :). I on the other hand had another 6 and a half hour game where I managed to beat a 2295 FM! I had to grind him down a pawn up with B+N vs B+B plus some pawns. Ga has taught me to fight on and on and that’s what you should do too!